Dominyun got his first stakes winner in Sunday's Grade 2 West Texas Futurity at Sunland Park. WAYNE, OK�APRIL 12, 20215�First crop sire DOMINYUN got his first stakes winner on Sunday when fastest qualifier Nucky won the 57th running of the Grade 2 $198,924 West Texas Futurity at Sunland Park on Sunday. The bay gelding broke alertly under jockey Salvador Martinez easily moved to front and finished three-quarters ahead of the field. Bobby D. Cox bred the DOMINYUN gelding in Texas from the Southern Cartel mare Southern Brook, a half-sister to stakes winner Dianetobewitcha and Dianetogetcha. The second dam is the G3 winner Dianetomeetcha by Special Show. Nucky, who is now 2-for-2 and has earned $98,594 and his victory should push Dominyun to the top of this week's first crop sire of money earners list. .
From his first 11 starters, DOMINYUN has 3 winners, 1 stakes winner with earnings of $129,726 and average earnings per starter of $11,793. His other winners include Adelady ($13,984) and Bp Judsen ($5,838). A son of leading sire Mr Jess Perry, DOMINYUN won or placed in nine of 11 career starts and earned $336,181. He was second in the Ruidoso DerbyG1) and third in the All American Futurity(G1), Dash For Cash Futurity(G1) and a finalist in the Rainbow Derby(G1) and Ruidoso Juvenile Challenge(G3). Also a homebred for owner Bobby Cox, DOMINYUN is out of the stakes-placed and multiple stakes producing Runaway Winner mare Runaway Dee Dee. He stands for a 2015 fee of $3,500 at Royal Vista Ranches near Wayne, Oklahoma. 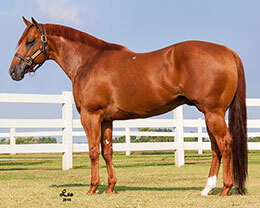 For additional information or breeding contracts call Laura Wipf-Erickson at 405-449-7575.